Pasargadae covers the archaeological remains of the first capital of the Persian Empire, dating from the 6th century BC. 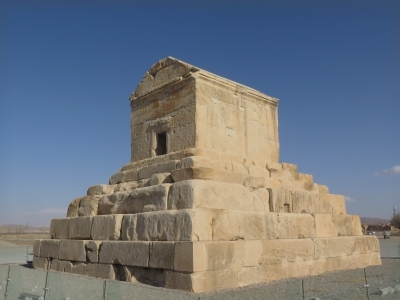 Its most important monument is the tomb of Cyrus the Great, the founder of the Achaemenid Empire who went on to conquer much of the ancient Near East, Southwest Asia, Central Asia and the Caucasus. Pasargadae’s gardens provide the earliest known example of the Persian chahar bagh, or fourfold garden design. The complex further consists of the remains of a fortress, palaces (‘the royal ensemble’) and a 14m high stone tower. In general, the art and architecture found at Pasargadae exemplified the Persian synthesis of various traditions, drawing on precedents from Elam, Babylon, Assyria, and ancient Egypt, with the addition of some Anatolian influences. Although the site doesn’t look like it covers much more than Cyrus “the Virus” oops not the baddie of Con Air, Cyrus the Great (one day coming to a theater near you also starring John Malkovich), the short path from the entrance which is now being nicely paved will lead you to a tomb of the once former king. It isn't all too spectacular, it wasn't even busy in January although Persepolis was still pretty packed. Once I circled around the tomb and made my way back from the adjacent ruins of the caravanserai (not currently part of the tentative site of caravanserai along the silk road), I noticed the shuttle e-cars with a booth. Was there more to see further down towards the mountains? So I go online, check the review here on the site and Google map to see the Solomon's Prison among others far in the distance. I didn't care if the shuttle costs money but it sounds like a bit of a waste of time. If you want to fully explore the site I suppose you should go and see those places too. 600 seems like a lot for “just” the tomb but it is the highlight. I was happy to be on my way again after a long day of sightseeing. Before investigating this WHS in advance of our trip in Apr 2016, I had always assumed that it consisted solely of the Tomb of Cyrus – that famous “profile” consisting of a 6 stepped ziggurat topped by a rectangular gabled chamber (making it the World’s oldest “base isolated” structure according to Wiki). As such, it could surely be fitted in easily on a 1 day return outing from Shiraz together with Persepolis AND Naqsh-e Rustam? In fact the site extends to 160ha (the inscribed area of Perspolis is only 13ha) and we spent 2 hrs there, not getting back to Shiraz until 19.30 (having departed at 8.20). If you are going to do a similar day trip make sure you leave some time for Pasargadae - unless you only want a quick “turn” around the Tomb! As you draw up to the ticket office (Entry for foreigners - 200k rials) the entry sign is accompanied by an enormous propaganda notice board proclaiming, first in English and then in Farsi, the words of Khomeini “The whole World should know that all of the problems of the Iranian nation and other nations are caused by the foreigners: by America. The Muslim nations hate the foreigners in general and America in particular”. Even our driver/guide was a little embarrassed by this since it seemed so out-of-line both with the welcome we (as “foreigners”!!) had received from every Iranian we had met and also with the general direction of Iran’s international relations. I have traced the statement’s history to a speech made by Khomeini at Qom on Oct 26th 1964 – not exactly “recent history”! It must have been the “last straw” for the Shah, as Khomeini was exiled to Turkey on Nov 4th and would spend the next 14 years outside Iran. Now, this quotation is apparently very “famous” in the history of events leading up to the Iranian Revolution (The full speech and its background can be found here), but the interesting question about its location in 2016 outside the World Heritage Site of Pasargadae relates to the nature of “power” in contemporary Iran which has led to its being published and remaining there. Who/which organisation has thought that this propaganda sign outside a World Heritage Site is “appropriate” and has been able to hold out against others who must surely think it is not? The Tomb of Cyrus is situated close to the entrance and seeing it isn’t going to take very long. You may gain value from walking around it a few times and, perhaps, imagining the visit of Alexander the Great in 330BC when, according to legend, he paid homage to Cyrus. You may also need to wait a bit to take a photo without hordes of tourists in it! You can’t actually approach the steps. Beyond, lie the remains of what was originally the dynastic capital of the Achaemenids. Its furthest point, the fortified terrace of Tel-e Takht, is around 2.5 kms away so, if you have a car, you might as well drive there and work your way back. In all honesty there isn’t a great deal “on display”. The Tel is made up of enormous cyclopean stones but has little else of interest. 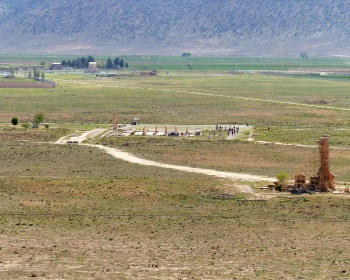 I provide a photo from its summit, not because it is a “good” photo, but to give an indication of the overall site and the dry plain on which it is set – the Tomb of Cyrus can be seen at top left. The Palace area is mid-centre with the “Garden” to its left. This area continues left outside the photo, is only accessible on foot and takes a while to cover. The tower on the right is the so-called "Soleyman's Prison". The area of greatest interest to us was that containing the Pasargadae element of the Persian Gardens’ inscription. This is a part of the “The Royal Ensemble” containing basically the floor plans of several palaces and pavilions plus a few pillars with some carvings – and the Garden. The site plan indicated that we were indeed “in” it - but it was very difficult to see anything which looked as if it could have been a part of a “garden”. There are a few stones which are said to be part of a bridge which crossed the river which, in those days, flowed through the city - but now all is dryness. Eventually we found a possible “corner” of such a garden created by 2 lines of carved stones which could have held a flowing stream as per the more modern “Persian Gardens” we were visiting around Iran. Don’t expect too much of this one! And that was about it really. One couldn’t recommend going out of one’s way to see the remains of the palaces etc but “that tomb” just about redeems it. On our way from Shiraz to Istfahan, we stopped at the tomb of Cyrus in Parsagad. there were some bas reliefs of a guy in a fish suit and a few other minor things, the city Cyrus built there was mostly made of wood, and that all rotted away ages ago. But the tomb itself was made of stone, and because the locals claimed that it was the tomb of Solomon's mother, it had survived the vandals. I noticed that someone had left a bouquet of flowers on the stairs leading up to the entrance in tribute. 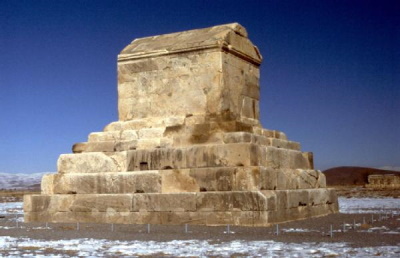 Iran has many beautiful names and often places all reminiscent of past grandeurs, Pasargadae being one of them. This is a city whose influence and historical signifcance was on a par if not rivalled that of Persepolis. Today it is very different though. With the best of intents we tried to imagine what was once there using the (well done!) signs and drawings at each site, but it was tough and beyond what we were creatively capable of. Yes, it was a dissapointment after the many hours it took us to get here. Fortunately Iran has countless other historical, natural and religious sites no to mention the local hospitality that made us rapidly forget our visit.